Manufactured from 1936 to 1937, this model was the first Retina made with a chrome top plate. All the other bright-work on the camera was also chrome plated, unlike the nickel finish used on earlier Retinas. Usually fitted with an Anastigmat Ektar f/3.5 5cm. lens like my one but also available with Zeiss Tessar or Kodak Pupillar. The shutter is a Compur Rapid. 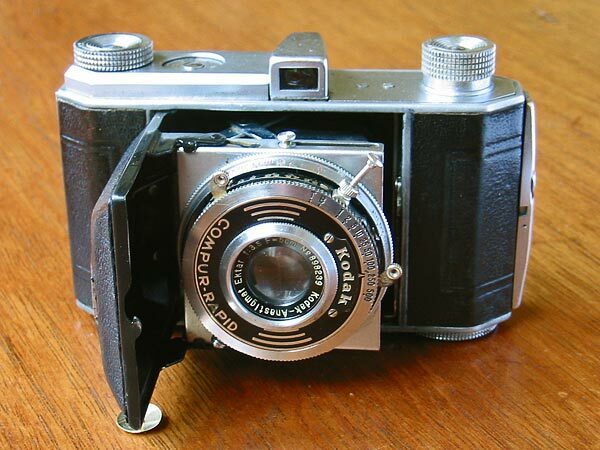 This model was offered at the same time as the type 119 model, which was the same camera except for the black lacquer finish, and the nickel plating of the bright parts. I was fortunate that this one came with the little screw-in shutter release plunger which is so often missing on the early Retinas.